I bring a notebook along on assignments, but what about when I’m not on assignment? We journalists do carry special notebooks, long and thin, but they can’t routinely be carried around unless you’re a woman with a purse or don’t mind sitting on a notebook in your back pocket (I do). Sometimes I remember to bring along a pocket-sized notebook, but not often. 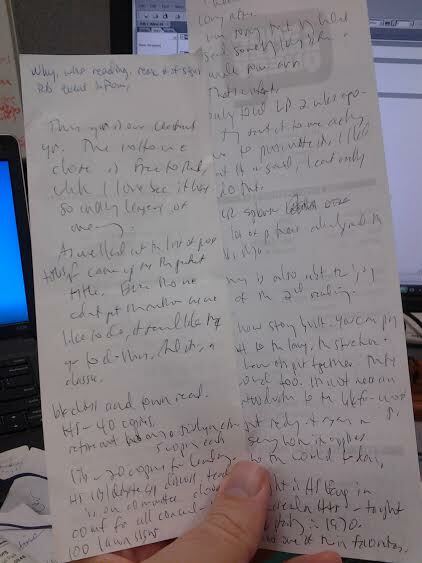 Frequently when I see a funny sign or want to remember something, I’ll scribble a quick note to myself on a random piece of paper at hand, maybe an ATM slip or even a straw wrapper. One morning last week I ended up conducting a short interview, semi-impromptu, at the Claremont library with the Friends of the Library president, but I hadn’t thought to bring a notebook home from work the night before. 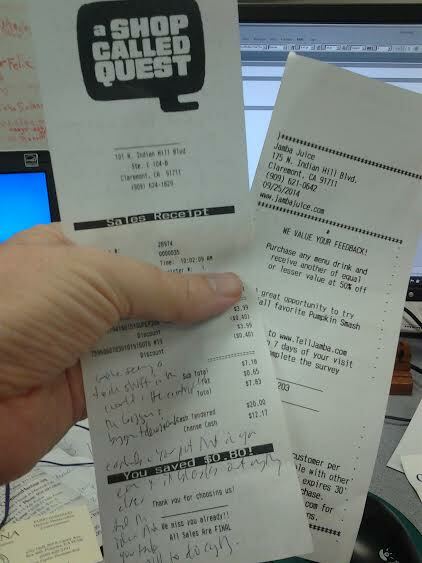 I made do with two receipts in my pocket. Had to turn one over to finish up. Good thing I’d made a couple of purchases or I’d have had to ask for a piece of paper. The former Person Ford dealership site on Foothill Boulevard in La Verne is now a residential complex named La Verne Village, which has 172 apartments. It also has some retail space along Foothill. Waba Grill is coming as are other small shops. The history of the site, once home to a revolving door of restaurants before the Ford dealership, has been explored pretty fully in a previous blog post. Sunday’s column starts with a local angle to the Sept. 18 JetBlue incident that made the news, then continues with some Culture Corner briefs and an item on a Rancho Cucamonga woman who won more than $44,000 in prizes and cash on “The Price is Right.” Now how much would you pay? If you’re in or near Rancho Cucamonga, come to the Archibald Library, 7368 Archibald Ave. (just below Base Line) tonight for the 20th anniversary party, 7 to 9 p.m. I’m due to be interviewed for a few minutes by Library Director Robert Karatsu around 8 p.m. and will then sell and sign my book, “Pomona A to Z.” I’m curious what Robert will ask me and how many people in RC will buy my Pomona book. I’ll bring plenty and wait to be surprised, one way or the other. Should be a fun night with lots of other things to do too: storytime, crafts, Beatles cover band and more. You can also meet my colleague Joe Blackstock and learn about the library’s history. Isn’t the above photo cool? It was shot by my friend and former colleague Marc Campos in the Norms parking lot. I didn’t know what effect he was going for until I saw the photo later. Ha! I was even wearing a yellow shirt! An unusual protest at a city council meeting is the top item of my Friday column, as Girl Scouts showed up en masse in Claremont to speak up for their campground, La Casita, in the foothills. The larger Girl Scout council in L.A. wants to sell it off and the girls were enlisting the City Council’s support. 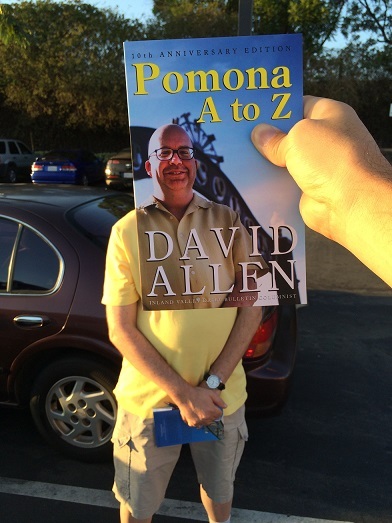 Also: three Pomona items and a comment about comments at council meetings. 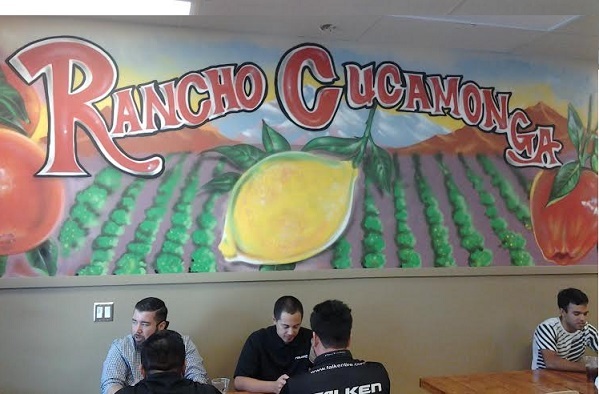 This is in Rancho Cucamonga’s upper reaches, two blocks above the 210 and across from the Trader Joe’s center. Citrus Kitchen is in a small center with a few shops and restaurants, and a clock tower whose time is perpetually wrong. 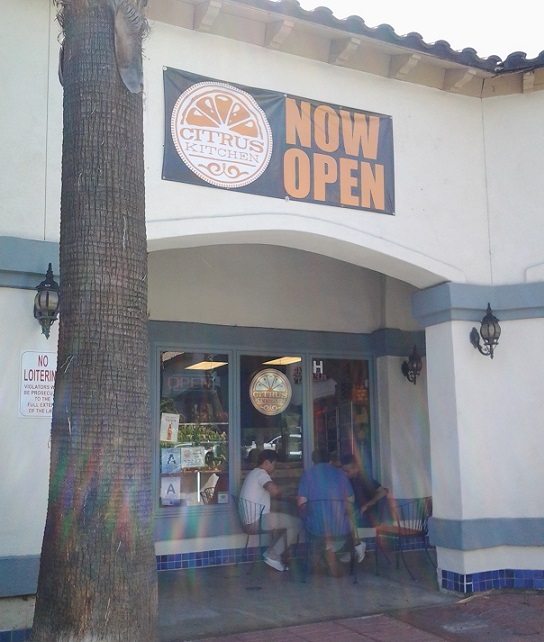 I’d heard good things about Citrus Kitchen, which opened in spring 2014, and met a friend there for lunch recently. The space is small and seating is limited; nearly all the chairs were taken, and there was a line to order, a good sign. 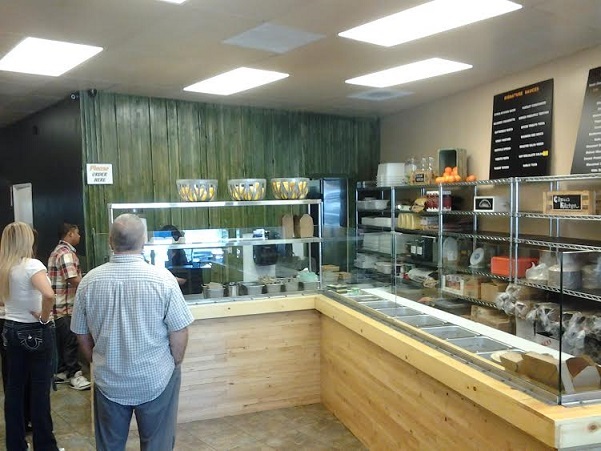 They have seven basic meals of shrimp, chicken (several styles), salmon, tri-tip, tofu and vegetarian, which you order in either “snack” or “meal” sizes. With a snack you get one side, with a meal two, from a choice of 13. Snacks range from $6 to $8, meals from $9 to $13.50. You also choose one of their 14 sauces. The whole “choose your protein” bit reminds me of Dr. Grubb’s in Claremont. In examining the menu, it was heartening to read the list of sides, which included couscous medley, local vegetables, vegan black beans, butternut squash saute, and kale and quinoa. There can’t be many places in the 909 with such an interesting assortment. 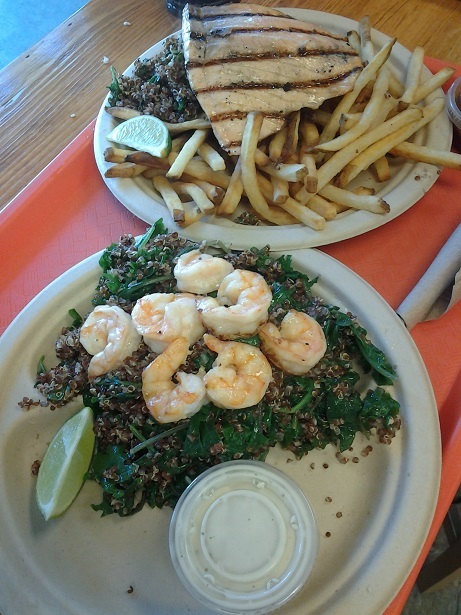 I got citrus shrimp ($8 snack) with kale and quinoa as my side; my friend opted for the citrus salmon ($8 snack) with the same side; he also got a second side ($3 for a small), baked shoestring fries. It took a good 15 minutes, long enough that I considered asking if we’d been forgotten, but it was during the lunch rush. The end result was great, though. We both liked our seafood, the kale and quinoa was light and healthy, and the fries were crispy. It also seemed like a lot of food. The only observation I’ll make is that one entire section of the L-shaped serving station doesn’t seem to be used for anything; if that remains the case, it might be worth removing it to put in an extra table or two. The restaurant seats about 18, including one outdoor table. Nice spot, many healthy options and vegetarian-friendly. Upper Rancho has more fun. Wednesday’s column is about the “Midcentury Modern: retro, classic, cool” exhibit in the Fair’s Millard Sheets Art Center. The Fair ends Sunday, by the way! Sunday’s column starts with news about the Rancho Cucamonga Public Library’s 20th anniversary, with a celebration Friday evening. (Yours truly will be there selling books.) Plus: items from around the valley. Friday’s column is the latest from the Ontario City Council: Paul Avila kept it toned down, but critics pounced on his colleague Alan Wapner. Also, one man brought a marionette. 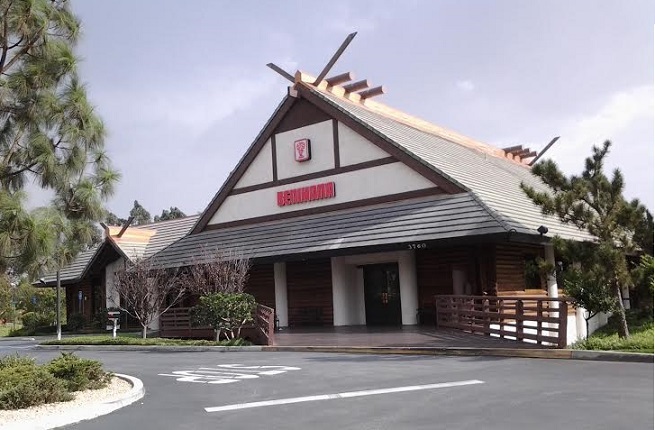 Benihana, the Japanese chain with an Ontario location, may be the Inland Valley’s best “experience” restaurant. 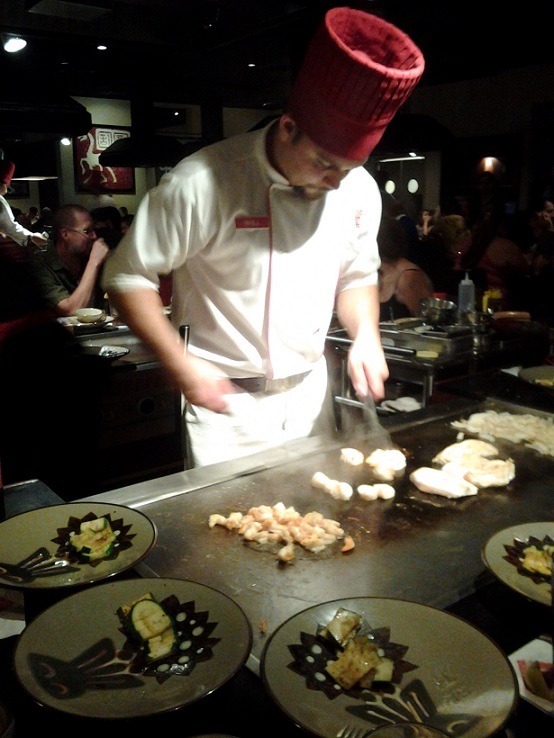 If you go for the teppanyaki, where you sit around the grill, the chef puts on a show involving fast action with the utensils, some sleight of hand and a few jokes. He’ll flip a few shrimp tails or egg shells into his hat or shirt pocket and maybe do some juggling. I shot a short video of the chef’s final flourishes. I’ve eaten there a few times over the years, including once on Christmas Day with my visiting parents, and returned recently with a friend to celebrate publication of my book. (Many more times I’ve been to the sushi bar.) It was as much fun as I remembered. I went for the Land ‘n Sea ($34), steak and scallops, and my friend had the teriyaki chicken ($19), both of which come with a small salad, soup, rice, grilled vegetables, hot tea and ice cream. The menu can be seen here. I didn’t go with the intention of writing a blog post, so I didn’t take many pictures. But it’s difficult to photograph your entree anyway because everything arrives in stages. The chef gives you the vegetables and a few pieces of grilled shrimp, and then, if you have a combo entree like I did, one part of them and then the other part, as he’s cooking everything at once. It’s not the greatest food or anything, but it’s fine, and the show is pretty good. Who can tire of watching an onion stacked in layers like a volcano shoot steam skyward? This time, though, the wait for the entree seemed long, and the chef encouraged us all (the tables seat eight) to get to work on our vegetables even though the bowls were still arrayed around the grill waiting for him to finish. I practiced a long reach to snag my mushrooms and onions. In a way, then, dinner was not entirely satisfying. Still, it’s an enjoyable special occasion restaurant. And it’s large! There are more than 20 grills, and most of them were in use on our weeknight visit. 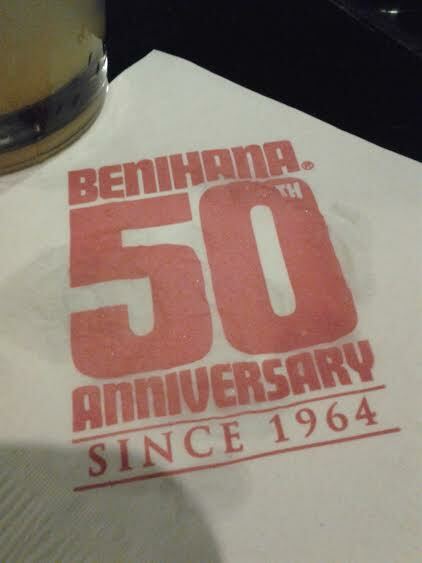 Did you know Benihana is 50 this year? I didn’t. According to the corporate history, the first, in 1964, was in New York City; there are now 70 around the world. I don’t know when Ontario’s opened, but probably the early or mid 1990s; Daily Bulletin types were going there on occasion when I started here in 1997. Oh, and at the end of your meal, they still give each group a Polaroid of themselves in a little paper frame, as if you were boarding a cruise ship, except here it’s free.